Gallstone disease is one of the most prevalent digestive diseases, resulting in a considerable amount of financial and social burden in the USA. Approximately 20 million Americans have gallstones. Because gallstone disease is a common clinical problem, basic and clinical studies on this disease continue to advance at a rapid pace, and a book focusing on basic science, current diagnosis and management of gallstones will greatly help practicing gastroenterologists, gastroenterological endoscopists, physicians and surgeons to understand the etiology of this disease and the availability of effective medical therapies. 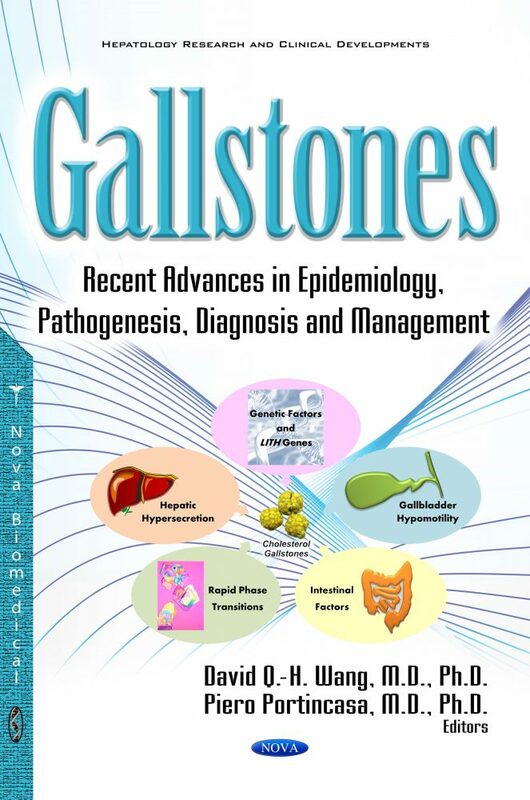 In this book, recognized medical experts discuss recent advances in the epidemiology, pathophysiology, pathogenesis, genetics and diagnosis, as well as endoscopic, medical and surgical therapies of gallstone disease. This compilation on gallstone disease was written by fifty authors from eight countries (Canada, China, Germany, Italy, Japan, the Netherlands, the United Kingdom, and the USA). There are thirty chapters in this book. Chapters One and Two discuss the epidemiology and natural history of cholesterol and pigment gallstone disease. Chapters Three through Six summarize recent progress in the pathogenesis of gallstone disease from a physical-chemical and pathophysiological perspective. Chapter Seven elucidates the roles of the immune system and the microbiome on the pathogenesis of cholesterol gallstones. Chapters Eight and Nine review the roles of nuclear receptors and the enterohepatic circulation of bile acids in cholesterol gallstone diseases. Chapters Ten through Twelve discuss the discovery of Lith genes and more fundamental knowledge concerning the genetic determinants and the molecular mechanisms underlying the critical role of Lith genes in gallstone formation in mice and humans. Chapter Thirteen discusses gallstones in pregnancy and explains why gallstone prevalence is higher in women than in men. Chapters Fourteen through Eighteen discuss the effects of diet, insulin resistance, obesity, diabetes, and nonalcoholic fatty liver disease on the formation of cholesterol gallstones. Chapter Nineteen provides diagnostic flow charts for biliary lithiasis. In Chapter Twenty, important non-invasive imaging findings of common gallbladder pathology are reviewed, and current strategies for the optimal use of imaging in the evaluation of patients with suspected gallbladder disease is discussed. Chapter Twenty-One evaluates current pharmacological therapy in cholesterol gallstones. Chapter Twenty-Two describes laparoscopic cholecystectomy. Chapters Twenty-Three through Twenty-Six discuss surgical treatment and endoscopic management of common bile duct stones and hepatolithiasis. Chapter Twenty-Seven reviews recent progress on the endoscopic treatment of bile duct stones with endoscopic papillary large balloon dilation. Chapter Twenty-Eight addresses surgical treatment of gallstones and their complications. Chapter Twenty-Nine discusses treatment of intrahepatic duct stones from a Western perspective. Chapter Thirty describes the history and incidence rate of Mirizzi syndrome, and summarizes recent progress in its classification, diagnosis, and management.